Buying livestock at auction, whether it be cattle, sheep, goats, fowl or equine, is a large part of farming life. Livestock sales can take place at centralised livestock yards within the farming community or with the advent of technology some auctions are being held at the property with bidding taking place online. Benefits from online sales are less stress and handling of the livestock along with less traveling and time savings for the farmer or purchaser. As with all purchases research plays a key role in buying well at livestock auctions which comes from knowing the market, picking the trends and knowing the quality of the livestock for sale. The majority of horses on the track today have passed through a sale ring at some stage during their life. They may have been sold as a weanling (six to 12 months old), a yearling (12 months – 23 months old) or at a two-year-old in training sale. Yearling sales are the busiest sales in the country and it is at these sales the competition for the next generation’s star is at its fiercest. Catalogues are available from the respective bloodstock sales companies approximately six weeks before the auction. Whether you have meticulously ploughed through the sale catalogue or have employed the services of your trainer or bloodstock agent to do it for you, when you arrive at the sales complex you should head for the stables and start your inspections. It is always wise to have your trainer, agent or vet to accompany you when inspecting thoroughbreds. At yearling sales, most of the horses will be at the sales complex a few days before the sale and in the majority of cases, the vendor will be available to answer any questions you may have. 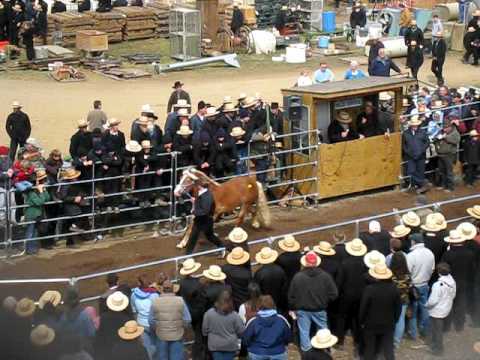 At tried horse sales you can usually only inspect horses on the morning of the sale. Before entering the sale ring, each horse will be paraded in an enclosure adjacent to the sale ring for your final inspection. Each horse will carry a lot number that corresponds with its order in the sale catalogue. Those horses that qualify for Super VOBIS bonuses also carry the Super VOBIS logo for easy identification. Super VOBIS is Victoria’s world-acclaimed owner and breeder incentive scheme, which provides bonuses on more than 1000 races a year – primarily two and three-year-old races. Once the horse is sold to you as the purchaser, the bid spotter will approach you and ask you to sign the “acknowledgment of purchase”.When you sign for your yearling, you may also elect to have it scoped. Scoping is a veterinary procedure that detects anatomical problems in thoroughbreds that may cause breathing problems whilst racing.